"It's like having an assistant chess coach and expert teacher available 24 hours a day!" Think Like A King® has created a complete scholastic chess curriculum of seven interactive tutorials that will help your children become better chess players and better thinkers - and allow you to create a culture at home where successful thinking is seen as the key to a successful life. The Chess Workouts© are the teaching arm of the Think Like A King® system. Written by experts at teaching chess to children, the Workouts take the work out of learning chess as lessons and puzzles actually come to life on the interactive chessboard. These interactive 'digital textbooks' are for everyone from reading-aged children to adults - so the entire family can join in the learning. Individually, each Workout CD addresses thinking in a different part of the game and has the content of a complete chess book: Tactical, Checkmate, Endgame, Opening, Advanced Tactical, and Advanced Checkmate Thinking. And for complete novices there's First Lessons in Chess© - the perfect way to get started. Unlike printed chess books which are often too tedious for kids to follow, the fully interactive Chess Workouts are totally engrossing. Users move the pieces on screen to solve problems, while engaging text explanations make the game come alive and provide students with instant feedback on their thinking. Students are rewarded with 'Workout Points' for their effort and knowledge as they move through each tutorial, learning their way up our Thinking Belt ladder until they've achieved a Black Belt - in Thinking! 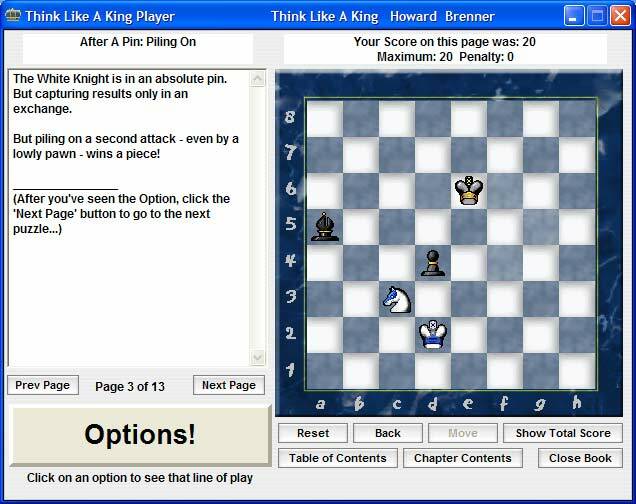 The Think Like A King system even allows work at home to be reported back to the coach if your school has a chess club. The Workouts are like having a private chess coach available anytime, anywhere ready to explain even the most complex ideas in a simple and engaging format. In fact, these may be the first chess 'books' that most kids read 'cover to cover'. They take the work out of learning chess.